Click the image …. and then read! Meteorite impact is a fascinating geologic process that for many geologists, however, has remained enigmatic. Therefore we are glad to present here on our website some results of experimental impacts that have been recorded by high speed cameras. This has been possible by a cooperation with Werner Mehl who is a world-wide known specialist for ballistics and high speed photography http://www.kurzzeit.com/eng/startseite.htm). Fig. 1. 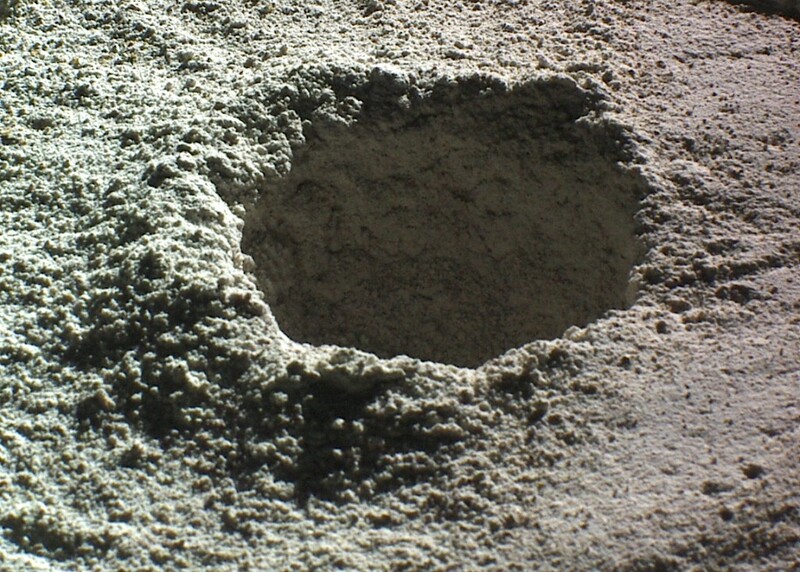 Experimental impact crater produced by a projectile (as lying in the hand) in a target of flour. The angle of the impact trajectory was 30°. On CLICKING a video can be played back that shows the impact process recorded with a high speed camera. The outer ring-like fold of the foil is a side effect of the experimental set-up. Fig. 2. Close-up of the hypervelocity impact crater. Details of the experiment are as follows:The projectile (the “meteorite”) is a 5 mm-diameter plastic sphere (Fig. 1). It is shot by a gun (Fig. 3) and leaves the barrel at a velocity of c. 1,500 m/s. On impact the velocity is lowered to still c. 1,250 m/s. This is a remarkably high velocity with regard to the comparatively low efforts W. Mehl makes with these unusually instructive experiments. Impact experiments performed by other institutions are utilizing “canons” of entirely different dimension. Fig. 3. 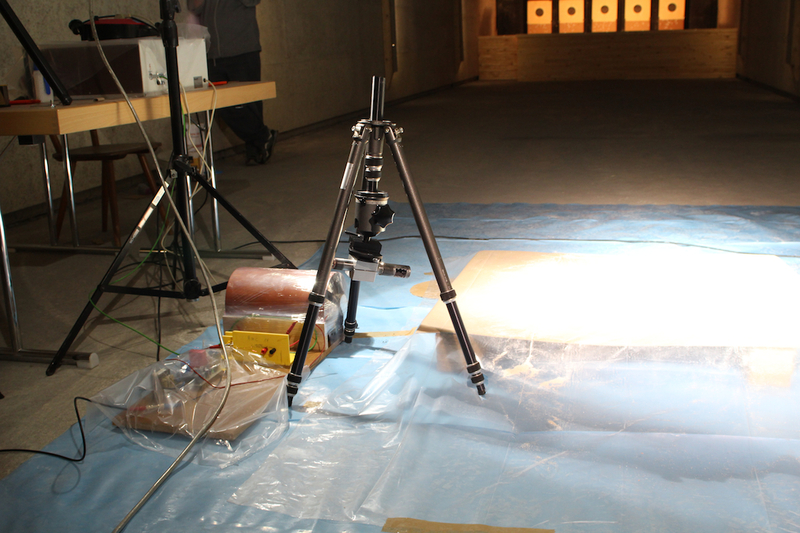 The gun positioned for a very flat angle of incidence. To the right on the floor the “impact target”. The velocity of the accelerated projectiles is a basic factor for these experiments of crater formation. As has repeatedly been mentioned here on our website true impact craters are formed by hypervelocity projectiles, i.e. the projectiles must impact at a velocity exceeding the sound (seismic) velocity in the target. Then, shock waves are generated which are indispensable for the formation of meteorite craters. On impact of cosmic projectiles arriving at cosmic velocities (in the range of c. 10 – 70 km/s) these conditions are fulfilled, of which more HERE. It goes without saying that the experiment must also meet this requirement, and this is why the projectile velocity produced by the gun is so much important as is the choice of the target material. In this special case, flour has been chosen which is estimated to have a sound velocity of the order of 100 m/s. Hence, the impact velocity of the plastic sphere of mentioned 1,250 m/s is considerably larger. 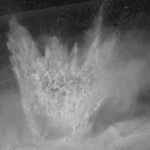 Consequently shock waves are propagating into the flour target, and observers not being in the “secret” are most surprised seeing that this tiny projectile is able to produce such a big crater (Fig. 1). That’s impact physics! The video to be downloaded here was taped with a high speed camera. The cameras used by W. Mehl are able to record up to 1 Mill. images/second, and 3D mode with a pair of cameras is also routine. In the impact experiment reports to follow we will publish respective 3D movies showing impressive processes of crater development. The video file shown here had an original size of 1 gigabyte and for good reasons had to be cut low for this presentation. On regarding the video (preferably in multiple re-run) the most important sequences of the crater formation including excavation and the developing ejecta curtain can be studied. They are producing the rim wall merging into the ejecta blanket of decreasing thickness around the crater. Very instructively, the video shows how already during the expansion of the ejecta curtain considerable bulks of the just developing rim wall are flowing back into the still enlarging crater. 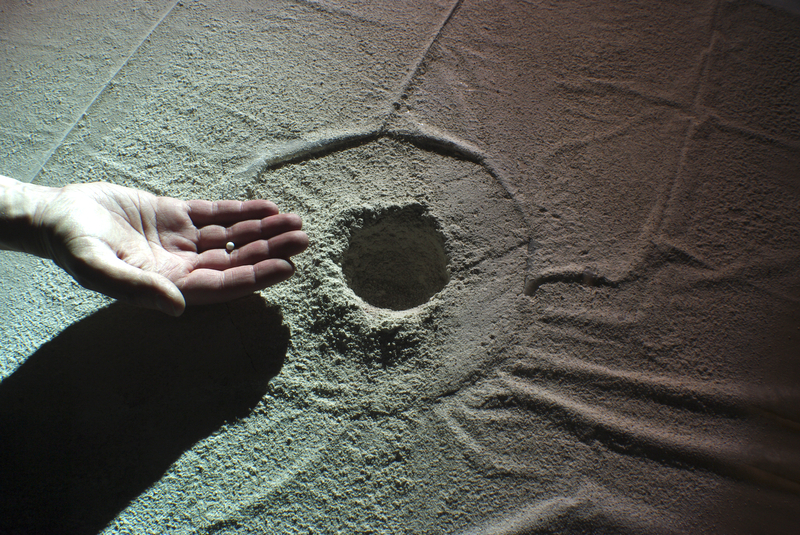 A very interesting observation can be made at the very beginning of the movie directly shortly after the contact of the projectile: Ejected target particles are leaving the ground with the beginning crater development at extremely high velocities (which have been estimated to be as high as several 1,000 m/s) (recommendation of starting the film several times in quick succession). Impact physics gives an explanation and points to a superposition of shock and rarefaction waves in the so-called interference zone leading to the high-velocity ejection of the so-called spall plates. In the case of the Chiemgau impact and the Lake Tüttensee meteorite crater this process is very remarkable in so far as “erratic” large blocks were again and again excavated from near-surface purely loamy ground (in part at larger distance from Lake Tüttensee) having regularly puzzled the locals. In fact, this may be understood with regard to such spallation “missiles”.